Early sky watchers used to enjoy and monitor our sky for celestial objects and phenomena, even with their lack of sophisticated instruments. Somehow, they managed to understand and develop the ideas that would set the basis for modern astronomy. Nowadays, when the concepts “space,” “astronauts,” or even “NASA” are used the first thoughts coming to mind may be those related to science, engineering, or technology. Yet, the truth is that the study of space is much more than just traditional subjects like Science, Technology, Engineering and Mathematics (STEM); it entails achieving new and innovative ways of thinking about our universe, thus leading to a new and an avant-garde way of perceiving all of our surroundings. As a result, a handful of students from the University of Puerto Rico Mayaguez (UPRM) sought to unify students from different academic backgrounds and encourage new and innovative perspectives about space related subjects. Therefore, the “Students for the Exploration and Development of Space” (SEDS) UPRM Chapter was founded. SEDS-UPRM Chapter will emphasize that one does not have to be a scientist, technologist, or engineer to contribute to the overall success of the space industry, but instead, business majors, art majors, and even people without a degree, may help drive the development and exploration of space. Unfortunately, many talented “boricuas” have to leave the island in search of a space related degree due to the lack of any relevant curriculum. In other cases, some students have to settle for other majors, that even though are not uninteresting, they stray away from their initial academic preference. Others even leave the island in search of jobs somewhat related to astronomy or aerospace in the absence of a solid space industry in Puerto Rico. In light of all this, SEDS-UPRM Chapter has risen in order to provide opportunities for all of these students that in one way or the other desire to pursue a space related career. These opportunities will enable society members to compete, develop, and participate in space activities here in the island, with the ultimate goal in mind of cementing a solid space development industry in Puerto Rico. Though it could be thought as an ambitious goal, we will strive for it gradually by offering projects and ideas to give knowledge and experience to our society members outside of classrooms and laboratories. Our colleagues from SEDS-USA offer various contests for SEDS members worldwide, including the “Business Pitch Competition”, “University Student Rocketry Competition”, “Satellite Design”, and more. The winners of these projects will receive awards and the opportunity to present their findings at the SEDS conference named: “Space Vision”. Furthermore, we will encourage SEDS-UPRM members to share their own project ideas to develop in the future. All of these will not only help the students to implement their skills, but it is also important to mention that the general public will understand the new frontiers that lie ahead. In accordance with SEDS-UPRM mission of inspiring the upcoming generation, we are thrilled to present our first event which is planned in collaboration with the Arecibo Observatory, the Caribbean Astronomical Society, and NASA/JPL Solar System Ambassadors. As the first organized event of our newly formed chapter, we decided that there was not a better way to initiate our society than with an Astronomical Observing Night. During the event, the Physics Department lobby at UPRM, place at which the activity will be carried out, will be packed with interactive tables for the public. At the same time, our participants will have the opportunity to witness some of the common, and not so common, celestial bodies through the use of various telescopes strategically placed in the vicinity. Additionally, the university’s planetarium is also scheduled to be open for visitors and will introduce some general information about constellations and a sample of the immense and rich history behind every star. 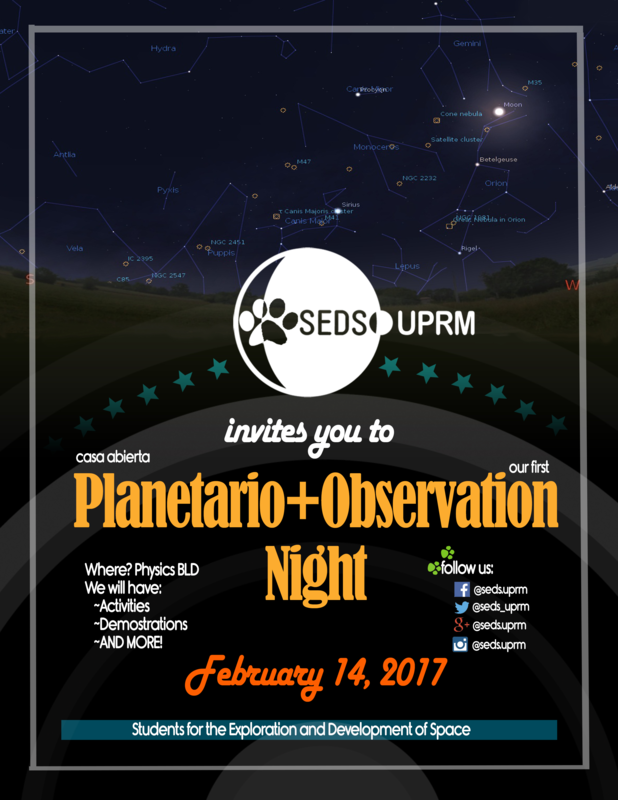 The Observation Night will be held on February 14, 2017 at the University of Puerto Rico Mayagüez starting at 7:30pm; and all of the activities will be free of charge. This event presents a great opportunity for everyone that feels passion towards space-related subjects as well as for anyone that desires to acquire an expanded view of the amazing place we are part of.